Existentially, this mix is a meditation on mortality, a fear of death (own and dear ones) and simultaneously a latent desire to shortcut the earthly path (a theme I started to explore in my Music for a New Beginnings). A kind of aural Maranasati, just prettier and less scary, or a reading from Seneca’s letters, but non-verbal and less moralizing. Kicking off with the sound of clay burial urns captured by Simon Whetham, it is centered around Sufjan Stevens’ lament to his late mother, which opens the gates of an “afterlife” that begins with a narrative from a Russian animation about seeing [signs and] wonders in mundanity and finding a waltz pattern in flashing street lights, followed by a limbo of Melanie De Biasio’s consolation to her own mother, and rounded off by a succession of heavenly piano music dissolving in the sounds of Latvian nature. We are all fireflies, waltzing our way between two eternities. Do you know how to waltz? 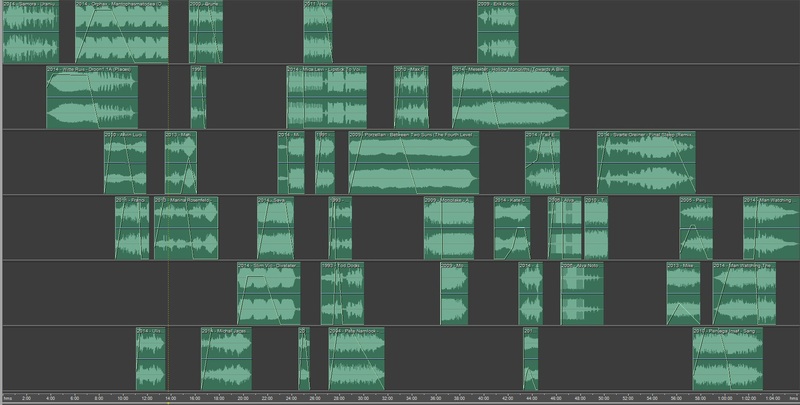 Of all my mixes, this one took the longest time of preparation and post-production. It was originally commissioned for and performed at Space Textures, an annual audio-visual festival in Riga, Latvia, curated by Sound Meccano. Careful selection of tracks lasted more than a month, during which I decided to play solely physical releases of various formats: vinyl, CDs and cassettes.Then, I invited my good friend Lee Chapman – British ambient and experimental musician now based in Latvia – to join, adding live processing and effects. After a few rehearsals, we settled on a workflow and a final tracklist; actually we even had a printed “score”, similar to a timeline of a typical PvC mix, because the flow was very tight and I had to utilize six sources – 2 turntables, 2 CD players and 2 tape decks, sometimes playing up to 4 tracks at once. And on 2015.09.06, we performed it, along with specially prepared visuals. Everything went smooth, except that… we forgot to press “record”. So this is it, the unprocessed mix made solely by me, but which wouldn’t have materialized in this form without the participation of Lee Chapman, to whom I am very grateful. In contrast to the original live performance though, I opted for using lossless digital audio instead of real tapes, whenever it was available. The vinyl parts, however, are still ripped from my records. If you live in a big city, and keep muttering “ah it’s too crowded, the sun is obscured by buildings, you don’t hear birds behind the rattle and confuse the moon with an ordinary street lamp” – so if you’re grumbling all the way like that at the noise and fuss, it doesn’t strike you that all of this has some kind of poetry in it. Fairy tales happen everywhere; Andersen’s times are unforgettable, and since our childhood we believe that wonders occur in an ordinary world that surrounds us. Street lights – what can be more mundane for a townsfolk? Just flashing all the way – red, yellow, green, one two three, red, yellow, green, one-two-three, one-two-three… Wait a minute, but this is a waltz! P.S. And because the maternal theme took shape prominently in the story, it was only logical using a painting by my own mother as the artwork. Thankfully, she is still alive and there is no river in her eyes at the moment, but the dialog between us is continuous, so this theme is very special to me. If you are interested, here are some other paintings by her.